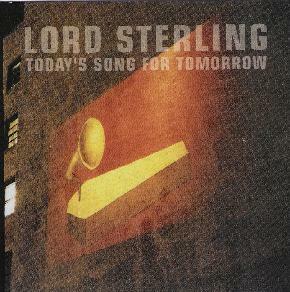 Lord Sterling - "Today's Song For Tomorrow"
Lord Sterling is part of the New Jersey psychedelic stoner rock scene and features Jim Baglino (now in Monster Magnet). The CD opens with "Pivotal Planes", a hard driving psych rocker with all sorts of weird sounds, horns, organ and effects worked into the head mix. I really like the vocalist (Robert Ryan) but not when he uses the angry vocals. He sounds so much better in the mid to low range. "This Time It’s For Real" is a straightforward rock song. "Hidden Flame" is a snotty punk inspired rocker and this is followed by "Thread Will Be Torn". This is where the CD really takes off into psychedelic rock territory á la On Trial. "Thread" and "Password" are really excellent songs inspired by the greats of the 60s, with organ, sitar and cool effects. "Poison Lips" is the most 60’s inspired track with that twangy guitar and effected vocals. "Evaporate" is a slow moody dark psychedelic trip! "Tough Times For Troubadours" is back to the aggressive rock of the earlier part of the record. The title track brings it back down and is a brilliant track that floats in it’s own space. The CD ends with a great cover of "Set The Controls For The Heart Of The Sun" by Pink Floyd. An excellent psych rock record! For more information you can visit the Lord Sterling web site at: http://www.lordsterling.net.